Born in Eveleth, Minnesota, Frank Brimsek was one of the first great American hockey players. 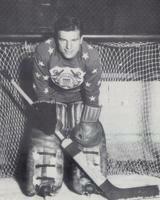 In the 1938–39 season, he was promoted to the Bruins following an injury to goaltender Tiny Thompson. Subsequently, Brimsek notched 10 shutouts that season, earning him the nickname "Mr. Zero." Since 1994-1995, the annual award is given to the states top goaltender after his namesake. The Brimsek - Mr. Goalie award, and Minnesota Mr. Hockey award are both sponsored by the Minnesota Minute Men.